"Until you have worked on something like this, you cannot know what a grill is." Our Infierno grills came from an early collaboration with NYC's Chef Dan Barber, who asked us to create a true live-fire cooking system for his Blue Hill at Stone Barns. It took two years, many tests, failures and iterations, but what came out still stands as one of our proudest achievements. The infiernos that came of this teamwork are truly our ships of the line. 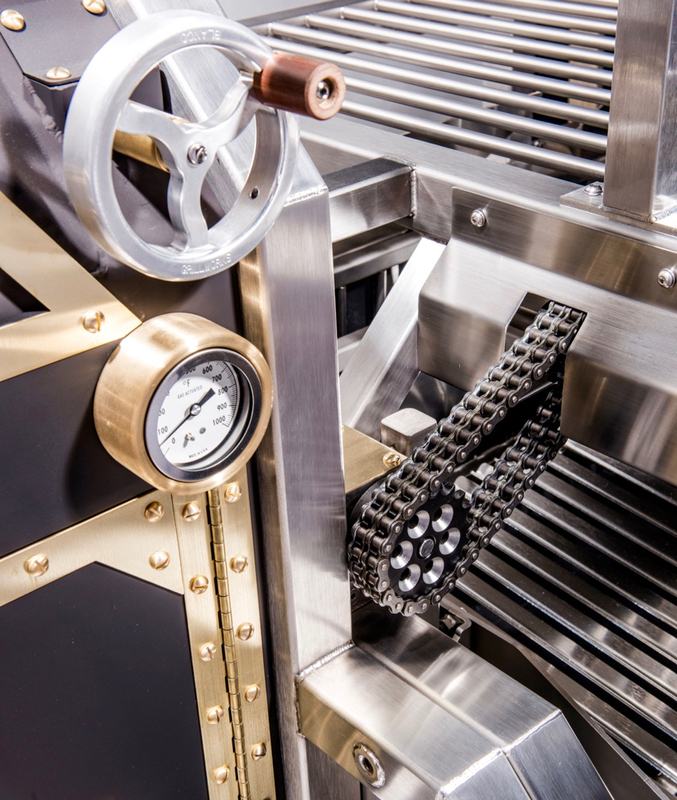 The Infierno Tigre is our largest and most advanced grill to date. A suitable flagship, she's armed with four grill stations each equipped with twin hot-swappable cooking surfaces, giving any culinary team up to eight different surfaces to cook on simultaneously. 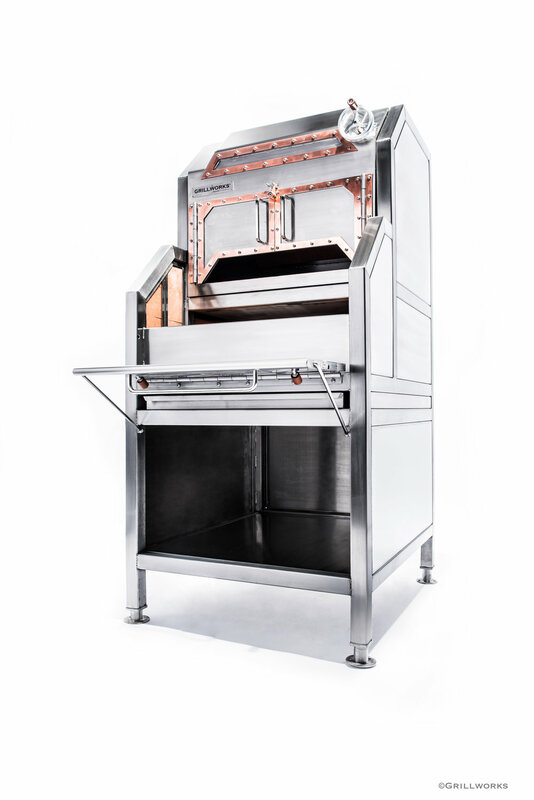 Flanking the central Blanco Oven are two of our brand-new multi-angle rotisserie stations, offering both large format vertical capability and traditional horizontal spits. Like her smaller siblings she also comes with a center plancha and acres of resting, staging and smoking zones overhead, topped by about a mile of suspension rail space. Call or email for specs, drawings and quotes. NEW! The Infierno X166 boasts four grill stations, each driven through an 18" vertical range by patent=pending industrial grade chain-and-gear lift mechanisms. Complimenting the open cooking is her integrated Blanco oven, pulling heat and smoke from the fires of the hearth. Resting and suspension shelves arc over the cooking area, giving the chef the flexibility to cook in practically any manner that he or she can dream up. Grilling, plancha, hearth cooking, rotisserie, slow roast, smoke, all at the beck and call of the most ambitious live-fire team,. Call (855) 434-3473 or email orders@grillworks.com for drawings, quotes and more information. The Infierno X100 is designed to provide all the features of the X240 and X166 in a more modest (but still plenty dramatic) footprint. She is over eight feet of flanking grill stations, Blanco wood oven (optional), hearth, overhead resting and suspension areas just like her larger siblings, and a host of accessories like plancha, specialty screen or bar surfaces (in addition to her standard V-Channels, and of course rotisseries (up to 2). This grill is the latest and greatest incarnation of the original Infierno 96 that has powered Dan Barber’s Blue Hill at Stone Barns since 2010. Call (855) 434-3473 or email orders@grillworks.com for drawings, quotes and more information. The Infierno X88 is a three station grill geared to leave plenty of space open for hearth work. The two large adjustable grill stations carry twin cooking surfaces, giving chefs up to four different cooking setups that move up and down up to 18” over the heat. Between them lies the third station - the hearth. This space can be used open, with free access to the brick, with a freestanding plancha, or the Infierno can be equipped with a shelf system in the space with removable frames that can hold all manner of pans or dishes in two positions between the base and the overhead shelving. Two short, or a single long rotisserie can be fitted to the X88. Call (855) 434-3473 or email orders@grillworks.com for drawings, quotes and more information. The Infierno X66 is the answer for smaller restaurants of for projects where the live-fire element is key, but may not involve the majority of the menu. 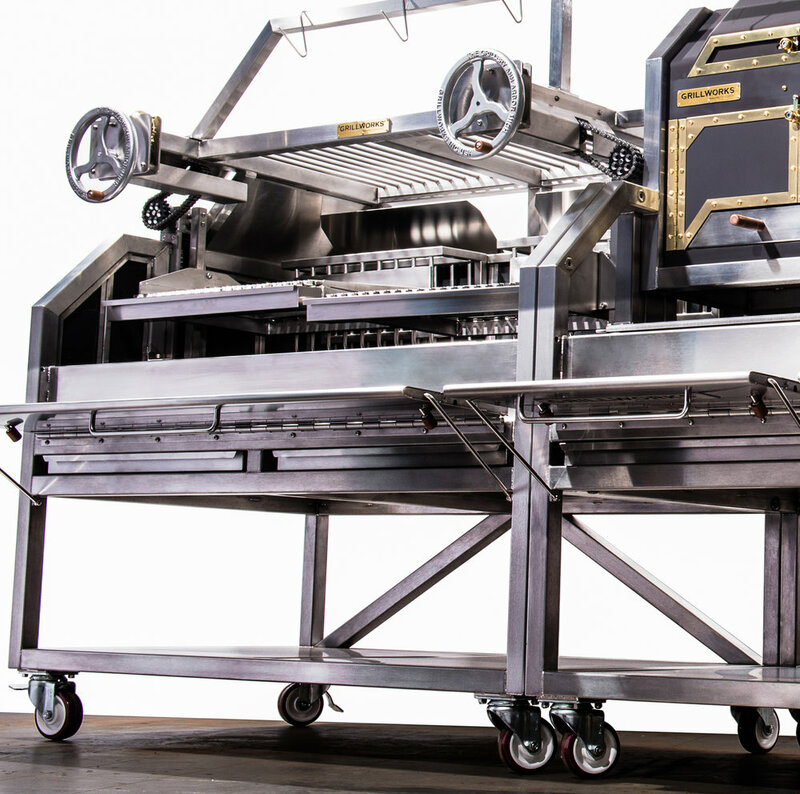 This grill is a pocket battleship, armed with the same heavy duty X-system chain-and-gear lift system, overhead resting areas, rear fire cage, swappable cooking surfaces (four sections on the two lift frames), and full-width rotisserie capacity. The Infierno X system is a patent-pending, ultra heavy-duty adjustable hearth cooking system. At the core of it is a unique one-handed crankwheel operated chain-and-gear that raises and lowers an infinite mix of grill surfaces over a professional hearth. In addition to the simple mechanics of operation, the X system includes a telltale Grillworks sound-and-sight height indicator that makes it easy for chefs on an active line to communicate ideal cooking levels to each other. Live-fire on an open hearth is often more art than science, so this system can shorten the learning gap between the seasoned chef to those new to the discipline. And we understand that our systems are stages upon which chefs perform for guests, so the X system visuals are unmatched in finish, presence and drama. In the Infierno line the X system is integrated into our flagship roll-in hearth units. The lifting gears are shielded from the action of the hearth while the elements critical to chef operation and guest eyes are exposed for all to appreciate. Like displaying the workings of a swiss watch or the engine driving an Italian sports car, the mechanics of the Infiernos, coupled with the fires they house, are designed to amaze the eye while their chef-drivers amaze the palette. 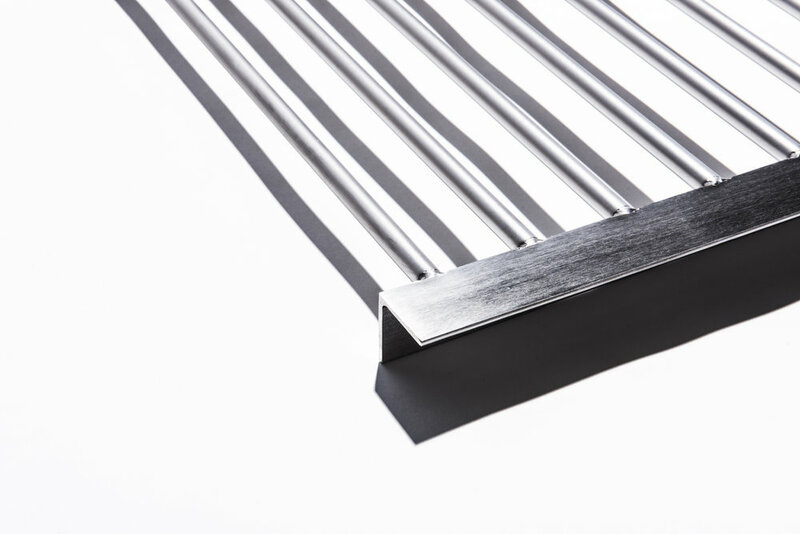 And we understand that every fire-driven concept differs in goal and scale, so the Infierno Xs are modular, allowing designers to create their own array of hearth, oven, grill, rotisserie or suspension stations without worrying about constructing an enclosure or settling for off-the-shelf solutions. Have an idea we aren’t offering? 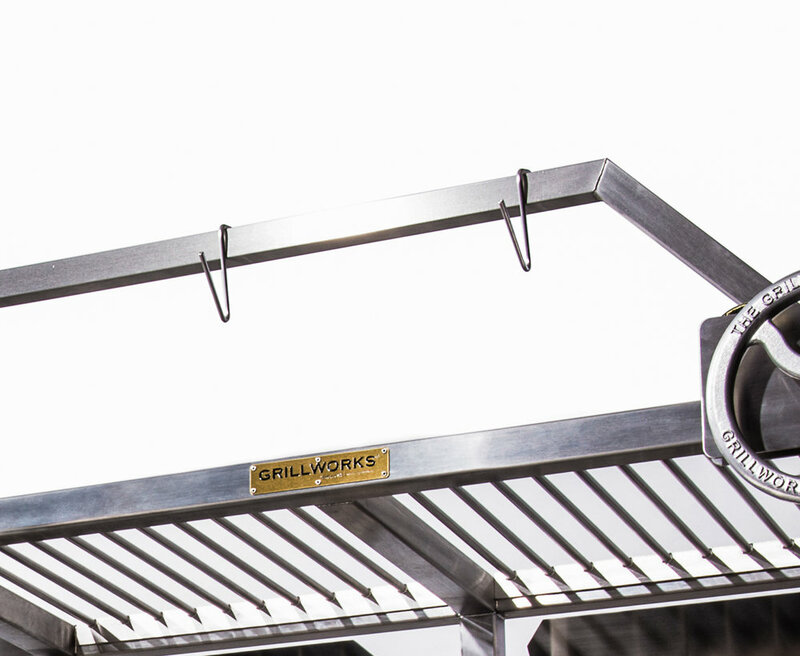 Grillworks relies on chef inspiration to keep bleeding-edge R&D churning, so we welcome semi-custom, custom and even crazy - actually especially crazy - X visions. The Infierno X240 Tigre, Infierno X166, Infierno X100, Infierno X88 and X66 round out this family of flagships. The first Infierno still stands outside the Blue Hill at Stone Barns dining room, thrilling those lucky enough to be seated near a window or with some extra time to walk out and watch the chefs in action. 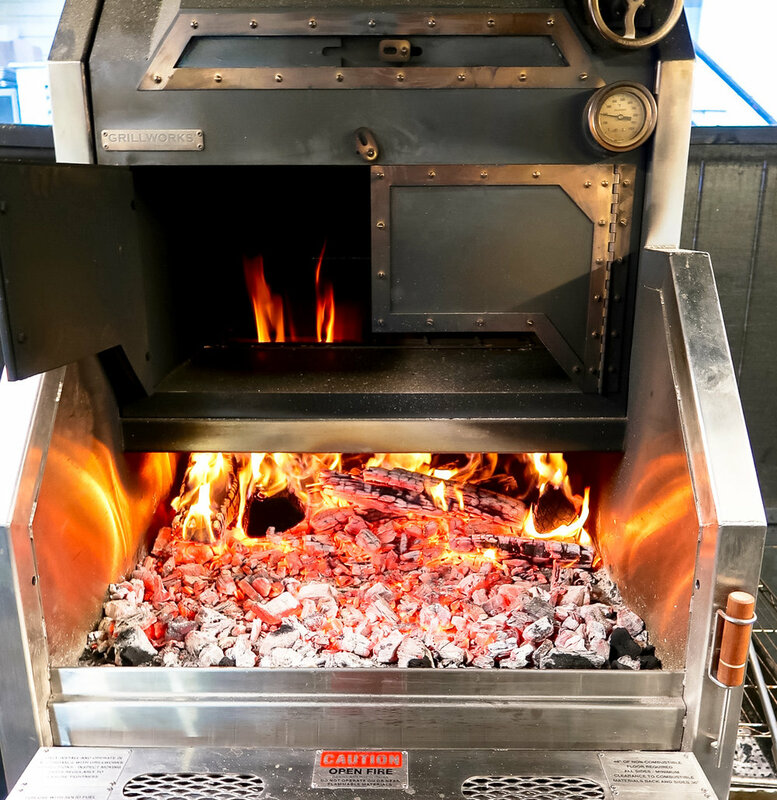 This grill was our first "big grill" and represented an all-out effort on both our side and the Blue Hill culinary team in putting together the most flexible live fire cooking system possible. 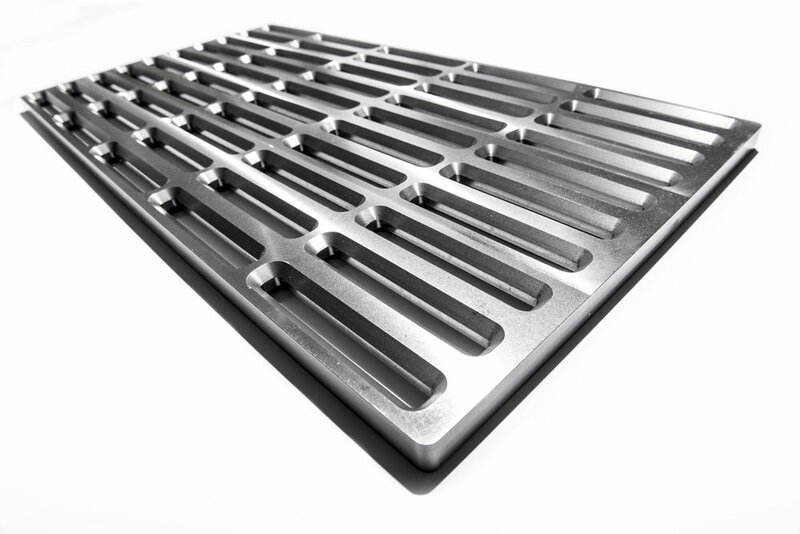 The grill is designed as a platform upon which a limitless number of techniques can be performed. 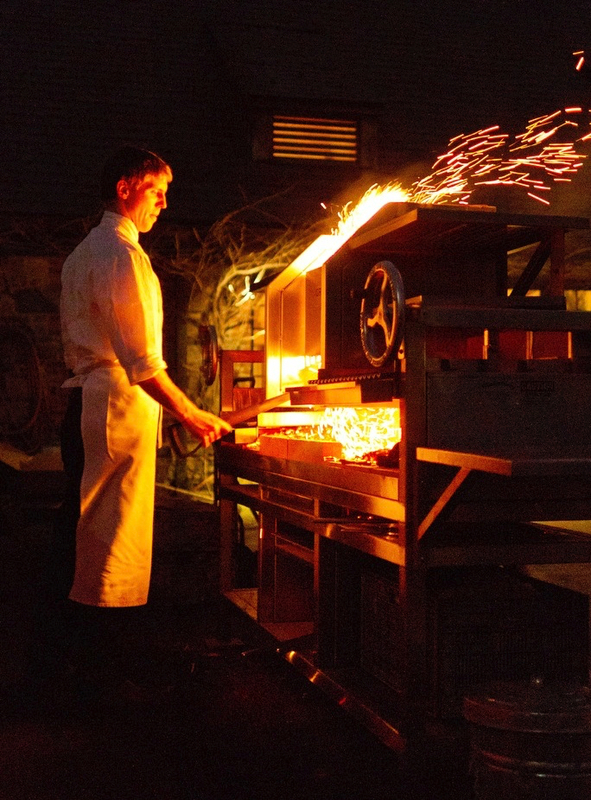 It is a hearth, a grill, a smoking system, and an improvised baking machine, And all this action is visible to customers - live fire cooking is a show. 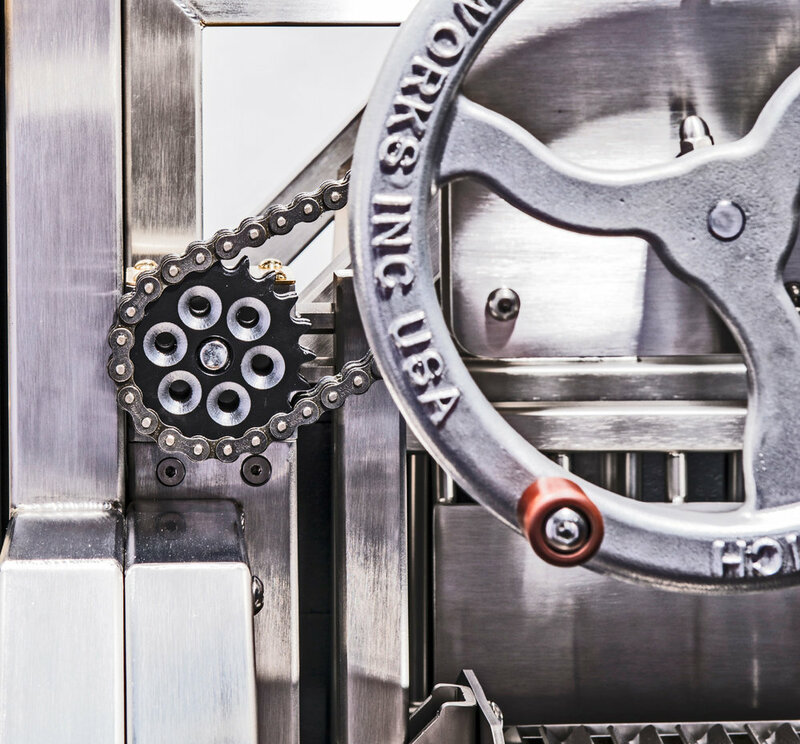 The Langelier 54 employs the same chain-and-gear X system that live in the Infierno X240, X166, X100 and X88, but svelte. Scaled down to bring about a true pocket battleship. Modest stature, excessive strength and an endless array of cooking options mean a small restaurant - or a large one in need of a built-to-fit live-fire weapon - will have the perfect balance of footprint vs function. Shown here with the Blanco Oven Cap, an adjustable-venting smoke oven chamber that captures the power of the hearth beneath to bake, short-form smoke or hold. Want the ultimate home statement grill? The Langelier is well-suited to bringing restaurant-grade performance to a home kitchen. Our new oven is a “white” - or clean oven, hence the Blanco name. There is no fire built in the cooking chamber - rather the oven’s internal heat is drawn in through a rear vent from the wood fire below, which also directly heats its soapstone deck. This guards against the surface cooling that can occur in ovens that rely on convection or in-chamber fires to maintain heat. Even with the main doors wide open the deck will maintain high temperature. An intermediate shelf inside the oven allows slower cooking off the deck, effectively creating two zones inside the chamber: searing surface and elevated slow bake. The Blanco is also well-suited to slow smoking with a minimal fire. Simply run a modest hearth coal bed with a slow-but-steady supply of smoldering whole pieces of wood and the smoke is drawn into the cooking chamber. The Blanco's hearth is also used as a grilling or searing zone, either directly on the coals or with our optional plancha or drop-in grill surface. You effectively have a combination open grill and oven in one 34" wide footprint. Can be delivered freestanding (shown) on a short stand for hearth install, or mounted into an Infierno 96 or 154. Call 855-434-3473 or email orders@grillworks.com. Download the Blanco Technical Manual here. Since we build everything to order we have a virtually unlimited customization capacity. If the request builds on our system we can generally do it. In fact, this often leads to new models when we discover a custom design will be useful for other customers going forward. Where can you see an Infierno in action? Check out our map of Grillworks-powered restaurants.